Eat them with your fingers! 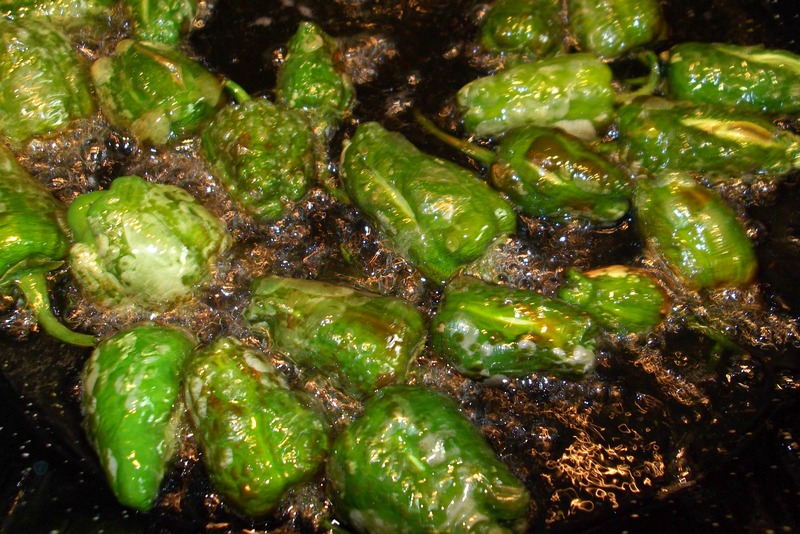 Pimientos de Padrón are a popular tapas, especially when they´re in season during the summer. 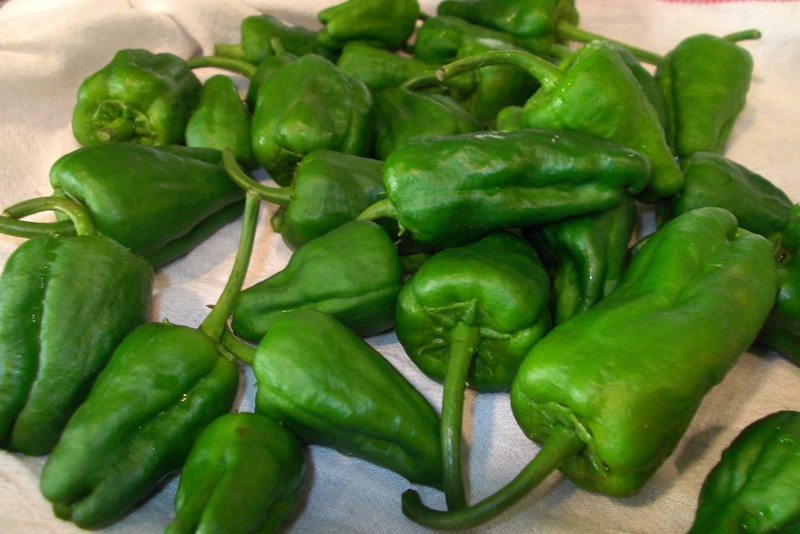 They are little green peppers that come from a town in Galicia (northern Spain) called Padrón. So, their name translated means “peppers from Padrón”. A little saying about them is that “algunos pican, otros no” which means “some are hot, some are not”. To be honest, as a dedicated chili eater, they´re mostly not that spicy…apart from some we grew last year which seemed to want to be like all the other chilis in the vegetable garden and nearly blew my head off! If you do manage to find them, all you do is deep fry them in very hot oil. When the skin starts to blister and turn black (this will take long moments rather than long minutes), drain them and sprinkle heavily with coarse salt. Eat with a cold beer to wash down the spicy, salty tastes or a delicious clara (that´s a shandy to you and me). 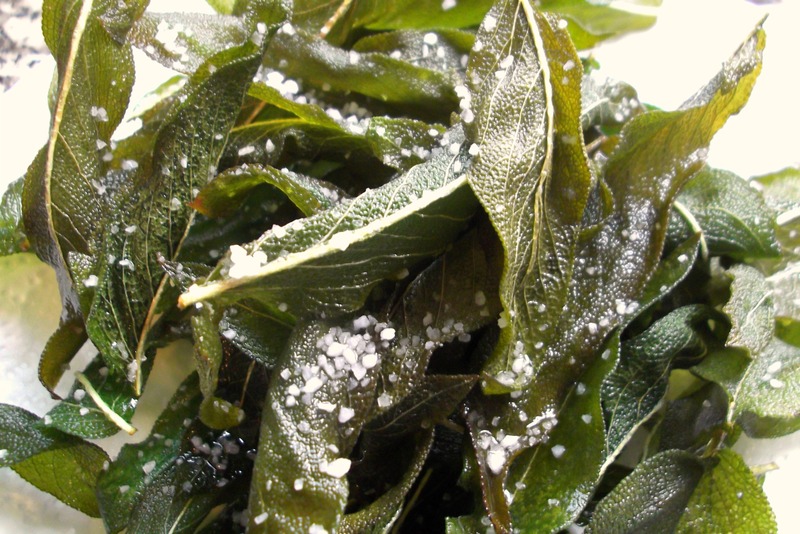 And whilst you´ve got that oil hot, how about quickly deep frying some sage leaves and sprinkling them with salt too. They can become really addictive, and as it´s a herb they´ve got to be better for you than crisps…haven´t they?! The drinks look very cooling and the pimientos look good, although when I’ve tried them they’re all too hot for me, so I make this dish with small sweet green peppers. Did you find the originals in Galicia? Yes, these were from Padrón, but we have also grown some from seeds that we got a few years back from some others from Padrón that my sister in law gave me. They progressviely got hotter each year (which was strange) so next year we´ll probably start again with new seeds! Hmm, wonder if I could handle them Pimientos de Padrón. I have just planted my herb seeds so still need to be patient before I can fry some lovely sage. It´s a great way to deal with sage when it needs cutting back! Those look great! I’ll look for them in the market with my fingers crossed. You may find them where you are, but if not it´s also good with sweet peppers! I always seem to get the hot one! Lidl in London? That´s amazing – hope you enjoy them. Don´t forget…plenty of salt! I didn’t grow any…but they sound good the way you describe them! Fried sage leaves? That, I can try! Russian roulette – you´re right, that´s how it is! The fried sage is sooo good! They sound very similar and would be great roasted too. Will those parmesan crackers be made with your very own parmesan, and do we get to see the recipe?! As much as I can appreciate the Russian roulette type of thrill, one hot pepper and I’d be done for the night. I think I’ll stick with the fried sage leaves. Ask me again about the pimientos after I’ve had a few shandies. Like cats who jump on the laps of people who are allergic or don´t like them, the hot ones always seem to get picked up by the non heat lovers and people like me spend the evening only getting the sweet ones! These look tasty! I’d need my peppers to be really mild though. I’m a wimp! You´re not a wimp – I´m just a spice addict! Hope you enjoy them – and it´s good ot have a few little vices in life! Wow, I want those and the beer. My mouth got hot just looking at them. I’m a sucker for fried sage leaves–plain, with pasta, etc. But these peppers…oh boy! I always order them at sushi restaurants, but never thought of making them myself, which is weird because I love them so much. Those cold beers would be perfect with the peppers! And they are so easy to make – if you can find them! Oh goodness. They look amazing! They are pretty good if you don´t mind the occasional hit of spice! They look fab – don’t know whether I could handle the heat! And if you don´t like the spice, I can guarantee that´s the one you´d pick out! Oooooh, voy a tener que hacer esto!! Thank for teaching me how to cook with all of the great foods available to us in Spain! Now that cocktail sounds right up my street! It´s funny – I had some hot yellow ones that have moprhed into something else too! These are what transitioned me from a “I’m not crazy about fried peppers” girl to a “GIVE ME MORE!! !” woman! Ale’s mom makes these often and I love them. The last time I tried to get a good picture but they just looked weird… good work! As, the good old Suegra! Have to say, I agree that fried peppers are not the most photogenic of beasties. Yes in sunny London 🙂 Does it work ok if I shallow fry rather than deep fry them? This is a fabulous snack food!! I could so see this at our next football party!! I love spicy hot! Oh yes!! 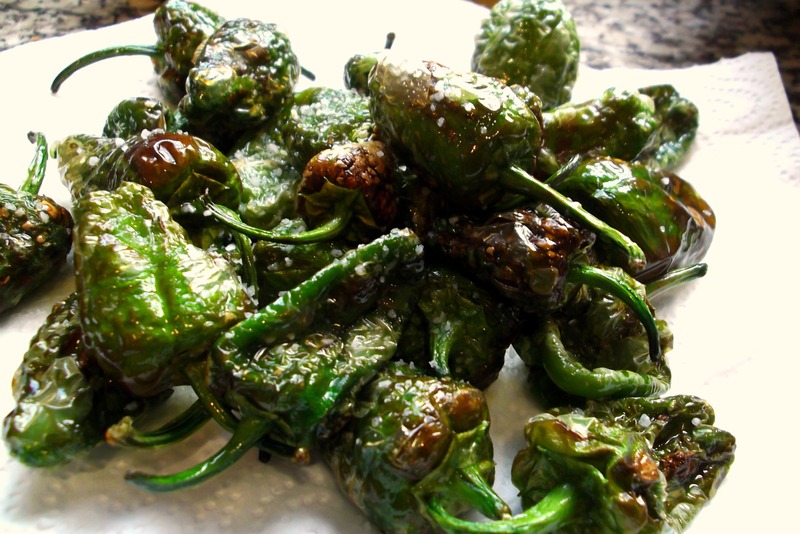 I would eat those pimientos de padron with my fingers!! It is funny in Latin America we call beer chela (in Mexico), rubia (in Honduras)….The idea of frying sage is cever and fantastic!!! Bravissima!!! Ah thanks RaeDi – hope you enjoy them! I’ve never found a spicy one yet! But I keep trying, I do love a clara too especially with fanta limon. Going out for lunch tomorrow definitely a clara day!! My theory holds out – people like us who like the spicy ones, never get them! It´s great isn´t it – will have to make some more as I fancy it now! Hi Chica, These look yum. Did you keep any seeds? I did indeed – will save you some! 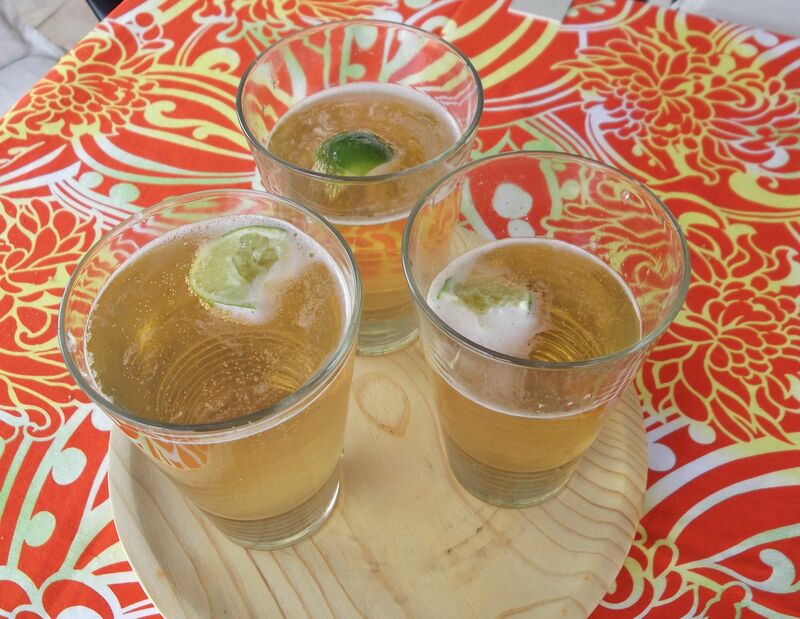 Okay – you got me craving a cold beer and some of those fried goodies of yours!